I'm the kind of person who likes to reread books and rewatch movies and TV shows. I don't really know why. I think I'm just wired this way — not knowing what's going to happen stresses me out, and instead of just enjoying the journey I become too focused on getting to the point where I know it all. I've spent too many nights binge-watching and flipping frantically through the pages of a book just to figure out what happens next. But there's also a certain to revisiting a movie, TV show, or book throughout the years, and seeing how your perspective on it has changed. I recently plowed through the entire collection of The Sisterhood of the Traveling Pants and found myself rolling my eyes at the characters I liked best when I was younger, instead sympathizing with the ones I initially waved off. Ditto with Gilmore Girls (though boy, am I excited for that revival!). And The Graduate, for that matter (because here's to you, Mrs. Robinson — you deserve better than Benjamin). 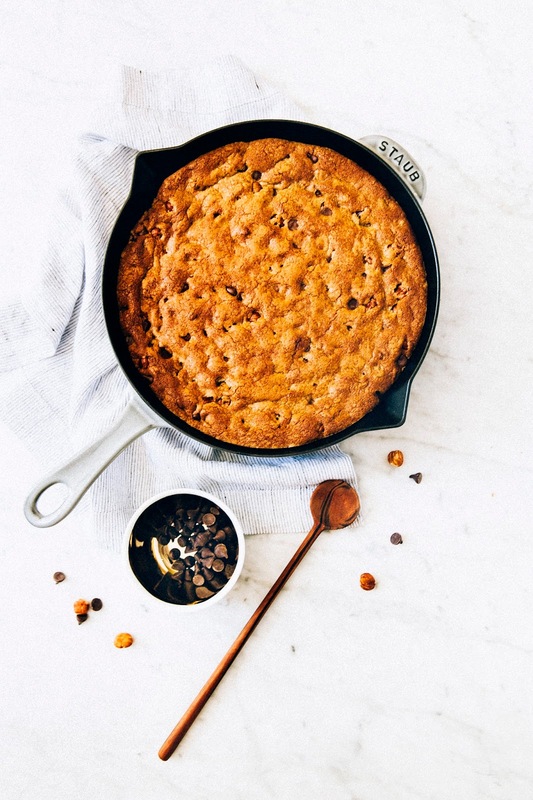 Because do you guys remember those giant chocolate chip cookie cakes you could get at the supermarket? The ones that were basically a single chocolate chip cookie about the size of the pizza, and usually had a neon-colored frosting job. I loved those as a kid. 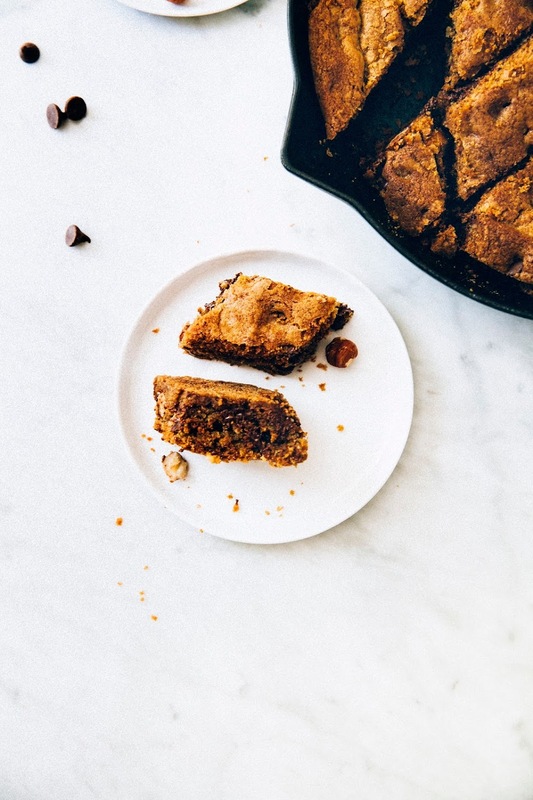 This recipe is sort of like that, but better because it's minus all the unnecessary sugar and artificial ingredients they usually threw in there to make those cookie cakes shelf-stable. 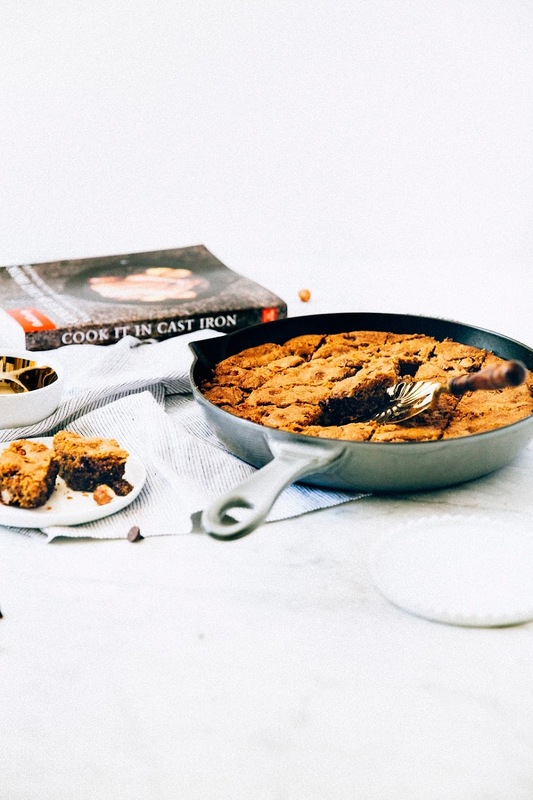 This recipe comes from Cook It In Cast Iron, a new cookbook in the America's Test Kitchen family that focuses on recipes you make in a cast iron skillet. 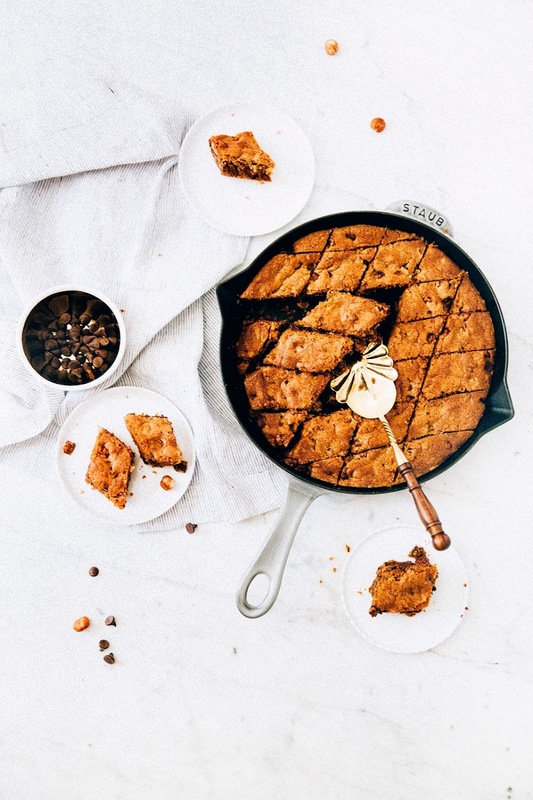 It's basically your classic chocolate chip cookie, but with brown butter and extra crispy edges from being baked in the skillet. If you're an "edge" person, this cookie's for you — even the chewy center pieces have perfectly crisp bottoms! It's all absolutely delicious. All that's missing is neon pink frosting, really. 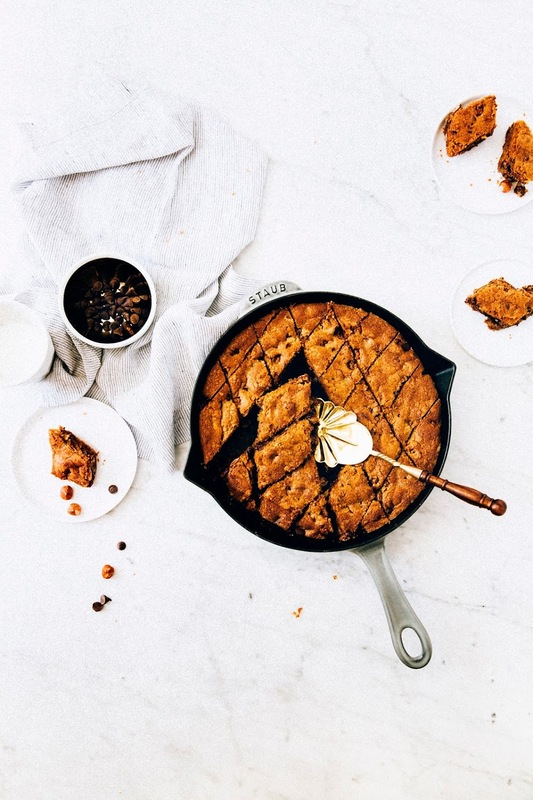 America's Test Kitchen specifically designed this recipe for a cast-iron skillet by increasing the baking time and cutting back the butter and chocolate chips quantities to ensure that the cookie baked through the middle. 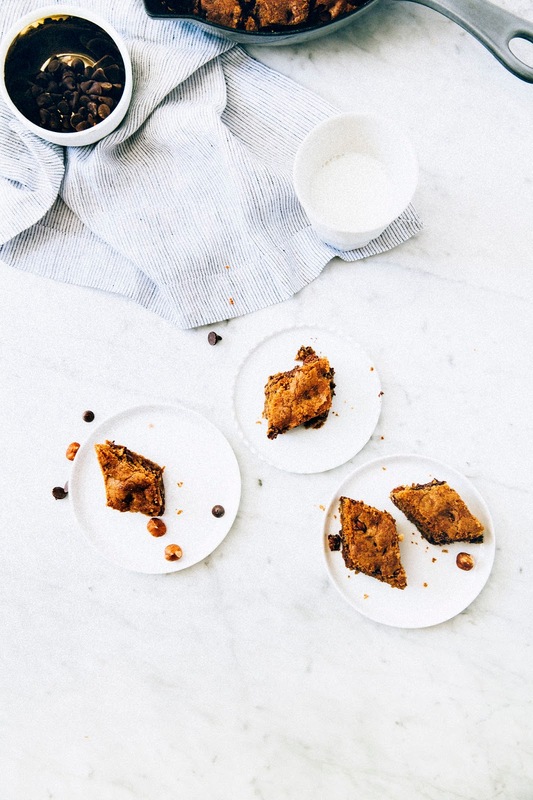 I don't think the recipe will work if you want plain ol' regular chocolate chip cookies — if you're looking for those, I suggest checking out this recipe for slice-and-bake cookies, or my favorite one from the New York Times! The original recipe uses a 12-inch skillet, but I baked mine in a 10-inch one and it worked fine (though it's a little thicker than what the original recipe has you make). You might also need to increase the baking time by 5 to 10 minutes if using a 10-inch skillet. Adjust an oven rack to the upper-middle position and preheat the oven to 375 degrees. 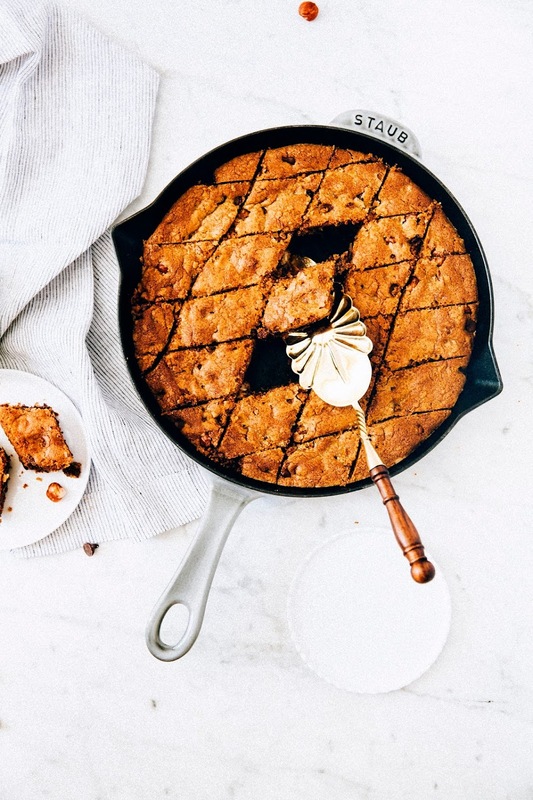 Melt 9 tablespoons butter in a 12-inch cast-iron skillet over medium heat. Continue to cook, stirring constantly, until butter is dark golden brown, has a nutty aroma, and the bubbling has subsided some, about 5 minutes. Transfer to a large bowl and stir remaining 3 tablespoons into hot butter until completely melted. Whisk 3/4 cup dark brown sugar, 1/2 cup granulated sugar, 2 teaspoons pure vanilla extract, and 1 teaspoon kosher salt into melted butter until smooth. Whisk in 1 large egg and 1 large egg yolk until smooth, about 3 seconds. Let the mixture sit for 3 minutes, then whisk for 30 seconds. Repeat process of resting and whisking 2 more times until mixture is thick, smooth, and shiny. Whisk 1 3/4 cups all-purpose flour and 1/2 teaspoon baking soda in a separate bowl, then stir flour mixture into butter mixture until just combined, about 1 minute. Stir in 1 cup chocolate chips (and if using, 3/4 cup hazelnuts), making sure no flour pockets remain. Wipe skillet clean with paper towels. Transfer dough to the now-empty and wiped down skillet and press into an even layer across the pan with a spatula. Transfer skillet to the preheated oven and bake until cookie is golden brown and edges are set, about 20 minutes. Using potholders, transfer the skillet to a wire rack and let cookie cool for 30 minutes. Slice cookie into wedges and serve.